Below you will see the incredible people, businesses and organizations that Linda has helped to live their best life today. Whether you are looking to make 6-figures in your business, or lose unwanted weight, Linda can help you, just as she has countless people all over the world, just by harnessing the power of the Subconscious mind. Stress reduction was not a priority and I would do multiple things at once instead of finishing one thing at a time. My concentration suffered and affected my entrepreneurial spirit. After working with Linda, I am now more immune to stress. I use my relaxation signal whenever I can, and I feel more comfortable following my own path. I am actively working on my concentration, meeting deadlines, and have a more balanced energy about me. The biggest transformation in working with Linda, was discovering (through Self-Hypnosis and ACT™) that there is a spirit within me, completely independent of other people’s feelings and emotions, and independent of my own thoughts. Working with the tools Linda gave me, I was able to reconnect to that spirit, and use these tools whenever I can. I really enjoyed the interaction with Linda. She is sincere in her efforts to help people improve their lives and that comes through. The changes were subtle – I would do things I had been avoiding without really thinking about it. For me, the realization of how far I had come was the day of my daughter’s wedding. I’m not much of a “social” person and putting all this together for her was truly a labor of love. In other words, a recipe for my procrastination to kick in. I found out at the last minute that I had to be in Houston for work the week of the wedding – time I had planned to use to do last minute prep. I had so wanted to be completely done with everything so I could enjoy the day with my daughter. The day after the wedding, as my husband and I were reflecting on everything and how flawlessly it went, I realized I had gotten exactly what I wanted. Without really thinking about it, I had done so much before that week, that the need to be out of town for work was really a non-issue. I want to share some of the positive experiences that have happened to me since I participated in Linda Allred’s ACT™ VIP Mentorship program. I came to Linda wanting to improve 3 areas of my life, namely my relationship, financial and health aspects. Even though I know what my true passion and desires are, for some reason I felt stuck whenever I made any forward movement towards my goal of becoming successful in my part time Health and Wellness company, as well as my personal life. It seemed that whenever I wanted to pick up the phone or go up to a person and share my business/products with them, I would have this self-defeating feeling and negative thoughts came up which blocked me from moving forward. It was really maddening, because I could identify it but couldn’t conquer it. In my sessions with Linda, to my surprise and delight, we were able to pinpoint the exact set of limiting beliefs, my “Kingpins’ and change the energy that they held over me. Once they were identified and deleted (changed) a peacefulness came over me and like I had always been that way. Within the first day of my program with Linda, I attracted a customer that literally jumped off a chair to grab me wanting to know all about my products and he bought everything I suggested! What an exhilarating experience. As a result of this type of energy, I was able to quickly climb up another level in my business effortlessly. As far as my relationship goes, let me just say that I feel as if I’m on a second honeymoon! I have had the pleasure of working with Linda this year and I must say that many areas of my life have changed for the better! One of the biggest changes has come in my finances! There was always more going out than coming in. Now I have more of a flow and I just don’t worry about it anymore! Linda’s expertise in the ACT™ (Accelerated Change Template) and hypnosis work that she did with me was powerful, and I have had very tangible and fast results! She has amazing insight and intuition that she uses in each of her sessions. I feel I have so much more confidence in myself and this has enhanced every area of my life! I highly recommend her services for any area of your life you need help with!”. When I first started working with Linda in her VIP Mentorship Program, I was totally ‘stuck in a rut’ in a job that I truly detested, yet I felt incapable of getting out of it. Using the power of ACT™ Linda helped me identify the Limiting (subconscious) Beliefs that were holding me back from taking steps to instigating change, especially in my employment situation. After letting go of my feelings of low self-worth, regaining my personal power and my misconceptions about money, I am so happy to say that I now have a job I truly love and as an extra benefit even my relationship with my spouse has improved as well! After participating in the ACT™ sessions with Linda Allred, I find I have more clarity on where my subconscious beliefs have gotten in my way. Those negative beliefs had slowed me down from being more successful in my business and in finding a worthy relationship. By being able to clearly determine the ‘hidden’ issues I had with myself and others, that I was ‘not seeing’ before, I have been able to build upon a stronger foundation of belief in myself. I now know that I can be at the top of my game in business, have all of the things I want, set and reach realistic goals and find love that is true and long lasting. Although we are constantly discovering more about ourselves, I feel that the ACT™ program is a terrific tool to get to the root of many of our problems quickly. Linda recently spoke at the Women’s Prosperity Network (WPN) Speaker’s Workshop in Fort Lauderdale, FL and she gave a presentation that will stick with me for years to come! Linda is a firehouse onstage and has an uncanny way of connecting with each and every audience member. Even though the room was packed, I felt like she was speaking directly to me. I honestly felt as if I was listening to a female Zig Ziglar. 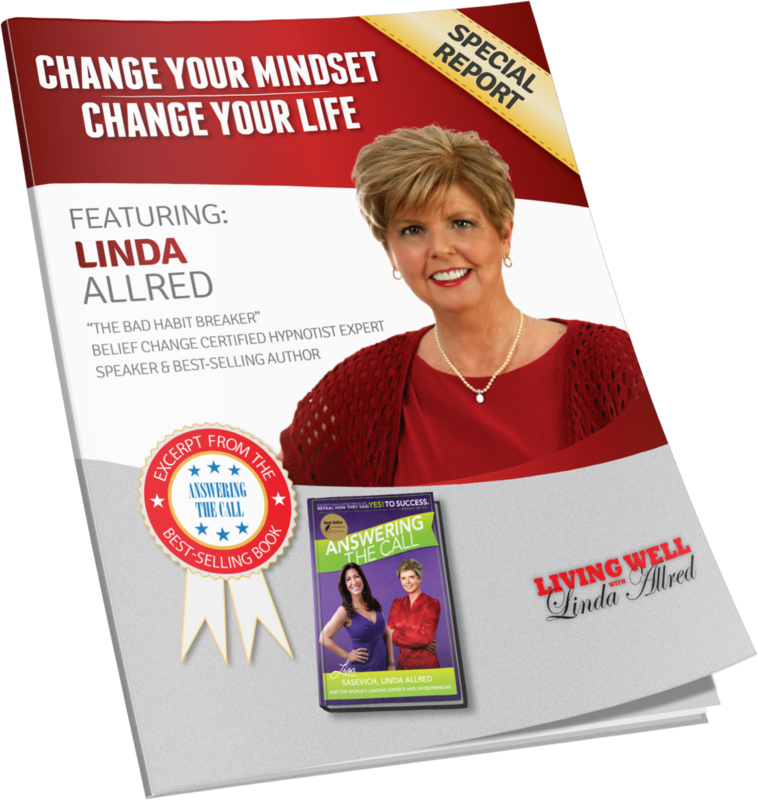 Linda has a way of delivering complex ideas and techniques in such a clear and moving way that you can't help but want to live your life in a new way. I'm so excited to have met Linda and would attend another one of her presentations in a heartbeat! Linda is simply amazing! Her presentation was interesting, engaging and eye-opening! Everyone was so impressed with her professionalism and her desire to see positive changes in everyone's lives! We were thrilled to have her speak to our group and we hope it isn't the last time! Linda recently spoke to more than 200 Best-Selling Author’s at our Best-Seller’s Summit in Hollywood, CA and all I can say is that she rocked the house. Everyone instantly fell in love with her and I remember seeing her during one of the breaks after she spoke - she was mobbed! Everyone wanted to talk with her. She delivered key principles that had everyone in the audience glued to their seat and feverishly writing notes. She has a great story and I am glad she was able to share it with our group. Linda Allred delivered a wonderful and very informative workshop to business owners recently. Everyone knows how valuable and important it is goals, but the mind is an incredibly powerful tool … if the goal is not “set” in the mind, chances are the goal will not be accomplished, at least not with the type of results you want to see. Thanks for driving that point home! “When I first made my decision to quit smoking I was a little nervous. I wondered if hypnosis could help me because it seemed as if all the other things that I had tried did not. From the moment that I met with you I knew that I had made the right decision. You made me feel that I could accomplish anything. My first visit with you was very informative. I knew what to expect right from the start. Power session one was wonderful. I was very relaxed and I did not want a cigarette afterwards. I loved having all of my hypnosis and positive affirmation CD’s at my fingertips. The coaching calls were very helpful and I felt empowered after every one. After 28 days I can look into the mirror at a non-smoker. Non- smoker – two words that I can use to described myself. Two beautiful words. Linda, you are a wonderful person. You really care about me as a person, not just as someone wanting to kick a nasty habit. Thank you for looking through the ‘smoke’ and finding Traci underneath.” Results atypical. “Linda, I had to write you to say thank you for everything you have done for me. You have changed my life around completely. What you have taught me during our Stop Smoking NOW Self-Hypnosis Home Study System™ sessions together I have brought it back home to my family and we are even closer than we were before. And believe it or not, my husband has completely quit smoking too! We spend more quality time together – all 4 of us! It is a good feeling! I feel calm, relaxed and in control and have lots more energy. I would highly recommend hypnosis and working with you to anyone who wants to finally quit smoking… for good. Thanks again!” Results atypical. “Both my wife, Jennifer, and I were heavy smokers and wanted to quit, but couldn’t find the willpower to do it on our own. A friend of mine at work suggested we contact Linda and give her program a try. We gave her a call, met with her for our first session, and to our amazement, we both stopped smoking that day! No cravings or anxiety. It was fun doing Linda’s Stop Smoking NOW Self-Hypnosis Home Study System™ together. We have more energy, feel better and our self-confidence has soared. It feels great to be free of the stigma, pain, suffering and embarrassment that we endured as smokers. Thanks Linda!” Results atypical. “When I started your Stress Free NOW Self-Hypnosis Home Study System™, I imagined that hypnosis was a magical experience where I would be whisked away and taken to another world. When I started working with you, I instantly was awakened by the power of my own mind. There was magic, but it was real – not fairy tale. I was able to see clearly how I could change my life in a more positive direction with a little work. It was all in my hands. You excited me and helped motivate me to make my life better. I would thoroughly recommend that anyone take your program. It is truly magical how my mind thinks more positively and clearly. Keep up the good work! Thanks a bunch.” Results atypical. “I told Linda at my free hypnosis consultation that my goals were 1) pain management, 2) stress relief, and 3) smoking cessation. I am ecstatic to say ‘mission accomplished’ to all three. I was surprised and delighted at how easily hypnosis helped me to experience pain and stress relief and, in addition, to stopping a 40 year smoking habit so quickly. I’d tried pain medication, physical therapy, acupuncture and even surgery to get rid of my chronic pain condition, and none of them worked. After one hypnosis session with you, my average daily pain level dropped from an 8 to a two. I tell everyone that I meet that if you want to improve your quality of life, all you have to do is pick up the telephone and call Linda. I can’t thank you enough for making my life enjoyable again.” Results atypical. “Success was taking its toll on everyone in my business including me. A hundred deadlines to meet, not enough time, schedules in disarray, worry, work and frustration were wearing me down. Then one of my employees brought in a brochure about a new Reduce Stress NOW Self-Hypnosis Home Study System™ Linda Allred was offering. I sent one of my colleagues to see Linda and she returned to the office totally in awe of what she’d experienced. That’s when I made the decision to try hypnosis and working with Linda to get some relief from my problems with stress. After one hour, the gnawing pressure was gone. I felt totally relaxed, calm and revitalized. My mind stopped racing and I felt whole again. I’ve become more effective in both my business and personal life as a result of hypnosis. I finally have balance and harmony in my life again. In my opinion, working with Linda is a bargain. As a matter of fact, I get large returns on my investment daily and I like having control of my life again. Thanks Linda!” Results atypical. “Before I started Linda’s proven weight loss system, I went from crash diet to the next biggest ‘fad’ diet trying to lose my unwanted weight. “I lost 2 dress sizes 6 years ago and I am so happy! I, like a lot of people, struggled with successful, long-term weight control, and hypnosis has unbelievably changed my life. Six years ago I contacted Linda Allred to start what would become a life-changing journey with self-hypnosis. Food is no longer an addiction for me and I feel content, happy, and healthy. “I was born fat! Even though I’m a successful business owner, I was always a failure at controlling my weight. I’ve tried every fad diet and product on the market but nothing worked until I entered the Louisiana Weight Off NOW Challenge and started Linda Allred’s Weight Off NOW! Get Healthy – Get Happy Bootcamp™. 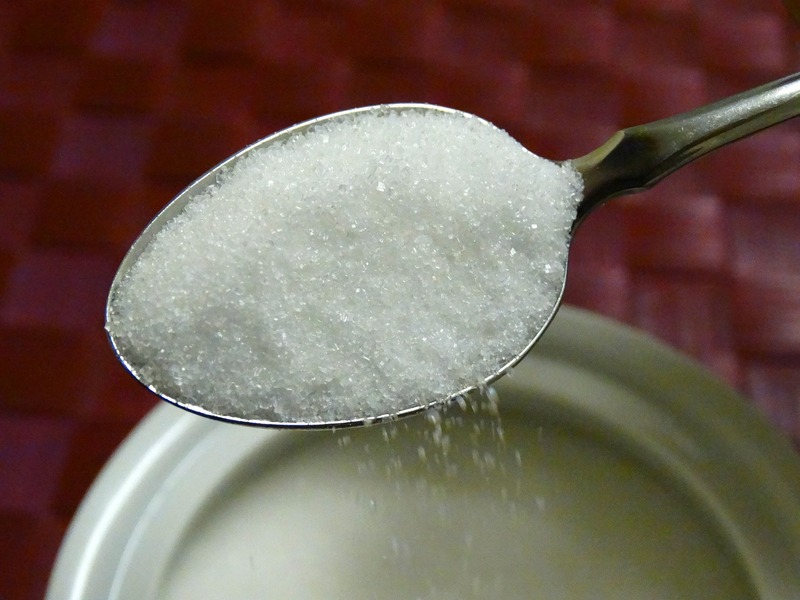 “Life before hypnosis: My entire life has been one continuous diet after another. Take weight off – put more back on. Pain, misery, and suffering. An endless cycle. I tried it all. I failed. 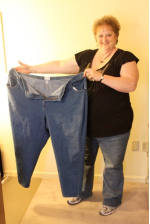 I was at my heaviest weight of 425 pounds when my marriage of 23 years fell apart. I was hopeless, embarrassed, depressed, and out of control. I decided to start a “Project Me.” I went back to school, decided to get healthy, take that ugly weight off, and find happiness. 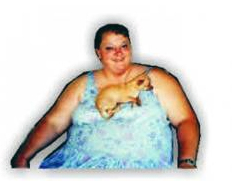 Hypnosis packs a powerful wallop and it has helped me to easily lose another 107 pounds*. Imagine! A total of 142 pounds! That’s almost a whole other person! Linda said I would prefer healthy foods to fatting foods and she was right. Now I crave chicken and broccoli – imagine! You have to experience the power of hypnosis first hand to appreciate its true value. Words simple cannot describe it. Today I am healthy, happy, in control, and with Linda’s help I will lose the next 100 pounds.